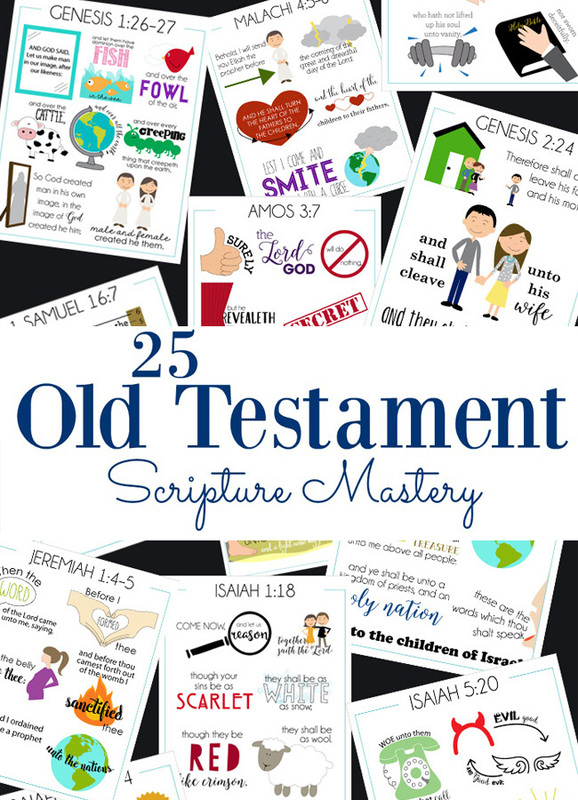 Those of you that have been around my site long enough know that I’m a religious gal, and I wanted to share something that I feel strongly about, Memorizing Scriptures! My goal is to share 2 scriptures each month, as options to pick one, or do both in order to Memorize a Scripture a month. For the past few months in our family, we have been choosing a scripture a month to memorize. It’s something I’ve wanted to implement for a while, and finally did it. Sometimes things have to swirl around in your head for a long time before you do it, right? I’ve loved seeing the kids excitement as we recite together as a family, what we have learned together. I remember when I was in high school, I attended an early morning scripture study class, and doing this very thing. Choose a scripture and repeat it aloud once or twice. Repeat the scripture, but this time discuss its meaning. We have found we memorize the words more quickly if we understand what we are saying. If you plan to learn a scripture a month, break it down into 4 parts, so you learn a section each week, and add onto it. Continue rehearsing the scripture until all have learned it. Sometimes we each take turns repeating it aloud, and sometimes we say it together. Since we each learn at different rates, our family sometimes moves on to another scripture before my youngest has fully memorized it. We regularly invite the youngest to repeat those scriptures she knows well, and we have occasional review sessions that help her—and everyone—recall scriptures we have previously studied. 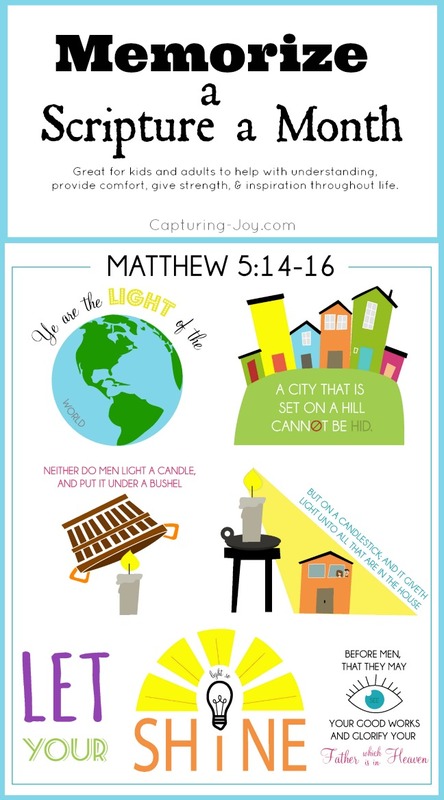 Back in high school, the first scripture that I ever memorized in full, and still have it all down word for word, is Matthew 5:14-16. 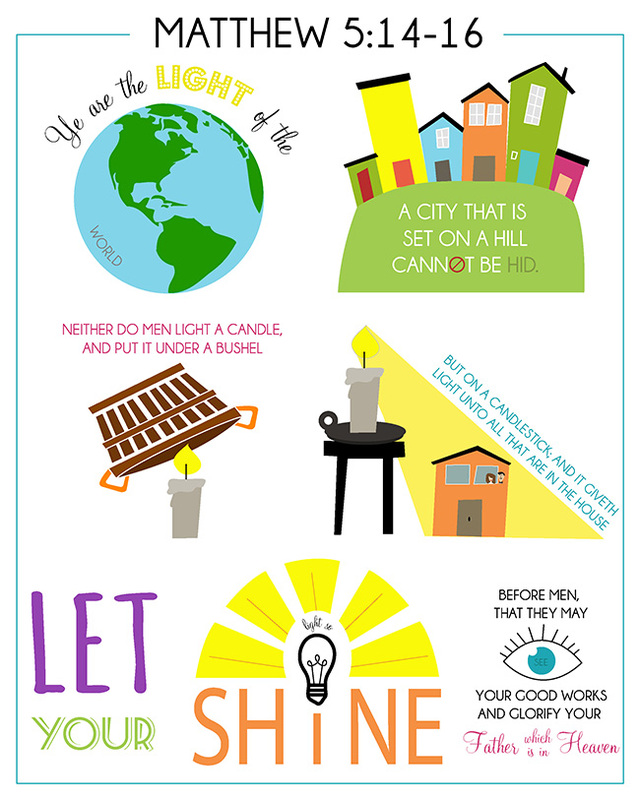 I’ve also seen it as one of my life motto’s, and a goal for this little website as well, to be a LIGHT in the world. There is just too much darkness, I want to be a light! The scripture reminds me to be that light, when times are tough, or when I feel frustrated and feel darkness creeping in. So I chose this as the first Bible verse of the year. My amazing and talented friend and designer, Jessika Reed blew me away with her design, when I mentioned to her what was swirling in my head. I wanted visuals and pictures to help my kids envision something concrete, while at the same time memorize it word for word. Can I just say that all this time, I thought a bushel was a BUSH! Nope, it’s a basket. So this picture visual taught me something, too! I’m so excited about this! Print, and hang it up in a prominent spot to help everyone memorize it! We generally do a line or two a week in our family, just working on that part each week. Along with sharing a Bible verse each month, I wanted to share a verse from The Book of Mormon each month. I know not everyone studies from that book, but I wanted to offer it to those who do, as well as share some of my favorite verses for those of you out there that are less familiar with The Book of Mormon. One of my most favorite passages from The Book of Mormon is Helaman 5:12, and this is the scripture my kids memorized a few months ago, and we keep repeating it to remember. 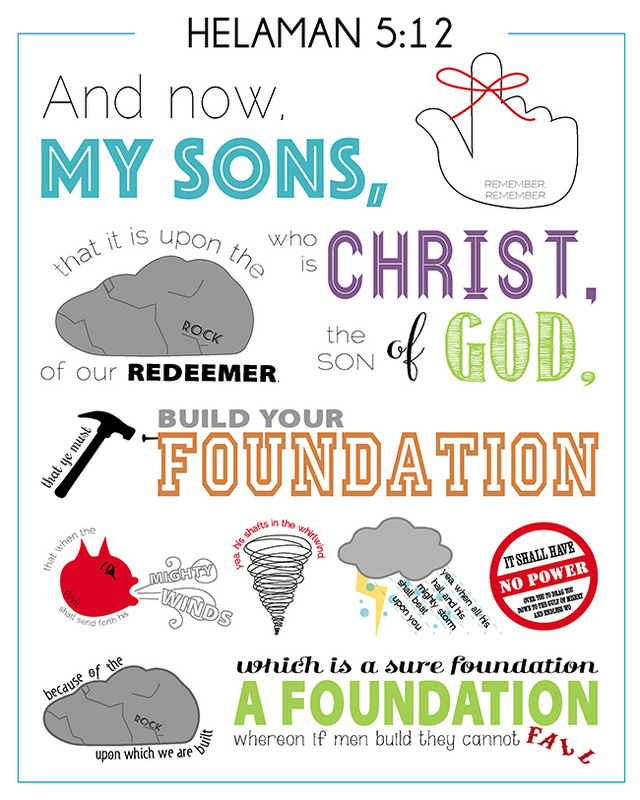 I think is it SOOO important in a gospel study, to focus on your FOUNDATION. I emphasize this with my kids over and over, that their lives, their spirituality, and everything is based on the foundation they build for themselves. Is it a firm foundation, or is it weak? What can they do now to help build that strong foundation of a rock? There will be whirlwinds and storms and hail, how you handle it is based on your foundation. This is one of my most favorite scriptures in The Book of Mormon. I hope that this can help those of you out there who might have similar goals in teaching your children. I love having these uplifting words run through my mind when I am frustrated, sad, or just need some direction and peace. My goal is to share these on the last Sunday of each month, to help you for the following month in memorizing, it just was a bit late this time. It’s a great New Year’s Resolution, right? Have you tried memorizing scriptures before? Jump right in!